Xeriscaping is a style of landscape design requiring little or no irrigation or other maintenance. For our arid Boulder climate xeriscaping is a method of planting with an eye toward water conservation. And it’s a local story as well. The term “xeric” was first used by the Denver Water board in the 80’s. Realizing that conservation was critical to their success, the board launched a regional—now international—school of gardening that would provide beautiful gardens that are smart as well. Living in the lushness of Boulder it can be easy to overlook the fact that we live in high desert country. And while water seems to flow endlessly from the tap, it is a finite resource that grows more precious by the year. While a xeric garden will never look like an English country garden, xeric plants are beautiful, thrive in terrible soils and once established will grow for years with little or no care. The xeric demonstration bed in our parking lot has been watered only twice this year but has thrived nonetheless. Xeric gardening does, however, require you to think differently about your flower beds. The plants may not look as lush as more familiar perennials do that have been watered every few days during the growing season. But once you get into the look and feel of a xeriscaped bed, you realize that you can build a beautiful garden that you can enjoy without endless hours of maintenance and watering. Xeric plants can be planted from April through September. You’ll have to water them well for the first two years while getting them established. With our normal weather your watering should be with decreasing frequency as these first couple of years go by. If we have a dry spell in the winter— above freezing with no snow or rain for two weeks or more—you’ll have to water in the winter as well. By the third year your plants should be up and running. And the consequences of less watering are twofold as less watering means less weeding. I have a concrete deck on the second floor on the west side of the house. It gets direct, hot, full sun all afternoon and the bricks of the house also collect heat so that anything in the planters on that side barely survive even if given plenty of water. On a trip down the Grand Canyon. I was surprised to see how many prickly pear cacti were happily growing in the rocks with very little soil and intense sunshine. So the next spring I put a couple of pads from a prickly pear into good soil in my planters on that western patio and nutured them for a few weeks. I went on vacation and forgot about them. They seemed to be fine with no watering until I got home so I decided to experiment and let them fend for themselves. This spring they rewarded my neglect with beautiful blossoms. Now that's Zeroscaping! We are very lucky in Colorado to have access to all the research that is being done by the Colorado State University Extension Service. They have wonderful fact sheets about xeriscaping in Colorado and share it freely on their website. 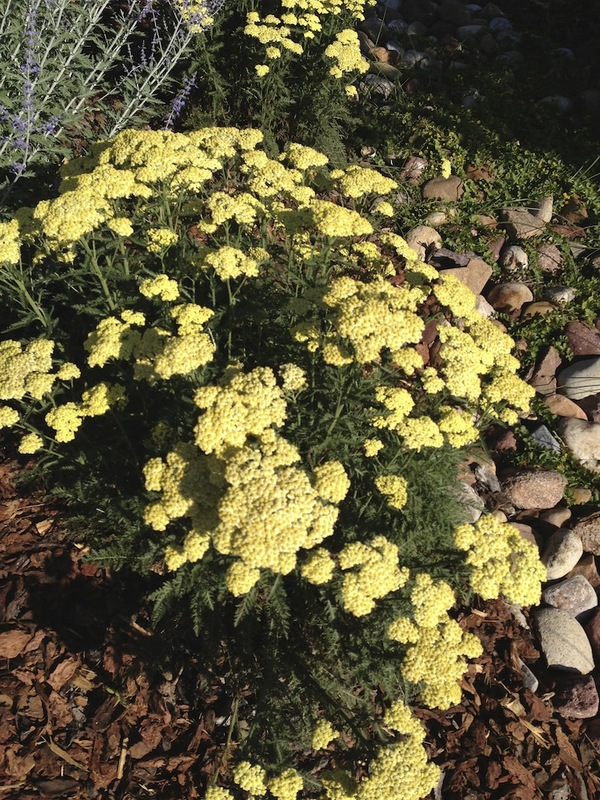 Here are some of our favorites xeric plants for Boulder County that do well with minimal water. The yarrows range from ground covers to plants that push their flowers four feet high. “Coronation Gold” and “Moonshine” are great showy plants with finely cut foliage and great yellow flowers. “Paprika” is a little smaller with brick red flowers and “Summer Pastels” feature light pink, white or yellow flowers that fade to white. Yarrows stay in bloom for a month or more. The big ones are great for backgrounds and pair nicely with the purple-blue flowers of Russian sage. Agastaches are highly scented and slightly demure stars of any xeric garden. Their pink, orange, purple or red tubular flowers appear in midsummer and last through the fall. It’s called hummingbird mint but it should be called hummingbird catnip. They’re crazy about this plant. These childhood favorites are tough as nails. Once established they’re a commanding presence in any garden. They come in double and single varieties and a wide range of colors. There used to be a mortuary in downtown Boulder that featured a stand of black hollyhocks right next to the front door. Kinda funeral, I guess. One harbinger of spring are the deep yellow blossoms of alyssum. They’re one of the first things to pop in the garden. This is a tough little groundcover that pairs nicely with deep purple aubretia, which blooms at the same time. The silvery leaves of this plant add lovely contrast to any garden and the variety of sizes and shapes of various cultivars is almost endless. Good for part sun to full. If it’s tough to find the color blue in your garden, baptisia is a great way to do it. These tall (3’-4’) shrubs feature deep blue flowers in mid-summer. This old-fashioned garden regular seems to have been forgotten, which is a shame. Once established they require little water. Coming from salt flats out west, callirhoe is perhaps the toughest plant we sell. With its pink cup-shaped flowers and elegantly cut leaves, it’s the summer star of our xeric demonstration garden. A low-growing groundcover with serious tap root, it will cover an area 6’ or more. It’s excellent for trailing over rock walls. And back to its toughness—at least three times semi-trailer trucks have backed over the one in our parking lot and it didn’t even flinch. Is there anything more glorious than a trumpet vine in full bloom? Although they’re a little slow out of the gate—they don’t leaf out until May—by July they’re covered with large tubular flowers. After five years these muscular vines begin to assert themselves and may require some serious pruning. Campsis comes in three colors—reddish-orange, canary yellow and pastel cantaloupe. They can also be trained “to a standard” wherein they are grown into free-standing trees by taking all the side shoots off each fall. This is a versatile plant whose beauty belies its tenacity. Small clusters of pink flowers rise atop clumps of blue-green leaves starting in June and continuing on all summer. Our dry weather keeps it in check. In Europe it grows everywhere, including out of cracks in buildings some 100 feet above the ground. 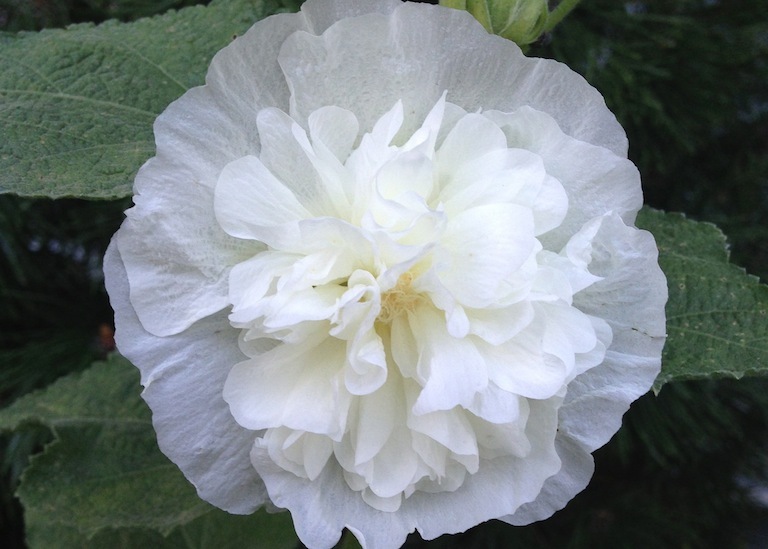 There is also a white-flowered variety. Plumbago is a hearty little groundcover with sky blue flowers and shiny green leaves, suitable for part sun to full shade. It spreads out fairly quickly with a little water. When the weather cools the foliage turns bright red, in nice contrast to the blue flowers. Mongolian Bells Clematis-Clematis integrifolia "P.S. Harlan"
The beautiful blue bell shaped flowers on this compact, one foot tall bushy clematis start blooming in the early spring in the harsh conditions of one of our trial xeriscape gardens in our hot, dry parking lot. They look so delicate, but they have to be tough to put up with the abuse they get in that location. Unlike its more colorful spring cousins, C. ternifolia blooms white in the fall. Clusters of flowers cover mature plants. It’s a good choice for an aggressive vine that doesn’t go completely ape like Virginia creeper and it thrives from full sun to full shade. Along with the many other members of this genus, moonbeam coreopsis is a cheery presence in the low-water garden. Tiny, light yellow flowers sit atop lacy foliage, providing a delicate foil for some of the more robust plants around it. A stalwart favorite of the Plant Select series, delosperma are succulents which flower in a variety of colors—white, purple, red, yellow and pink. “Fire Spinner”, a recent release, features blossoms with yellow and red petals and a white center. Once established they require very little care and an entire plant can be started from the smallest bit. The flowers open in the sun but the shadow of a single airplane passing over them will cause them to close simultaneously. The long unchanged echinacea has undergone a makeover of sorts—and it’s all to the good. Traditionally a tall lavender or white blossomed plant, it now comes in yellow, orange and almost red. Some feature semi-double flowers and others—most notably the “Sky” series-- almost glow. While the newcomers are a little more delicate than their original, a little compost at planting and a winter cover of mulch will bring them through to the next year. A true western original, the blanket flower has grown into a series of useful and beautiful plants. The traditional daisy-like yellow and orange flowers have morphed into sweet oranges, light yellows and burgundies. Some, like “Arizona Sun”, simply intensify the original colors while in “Dazzler” each petal has morphed into a little trumpet. Too cute! Of course there’s a grass named after your town. The original plants were found by a sharp-eyed Ted Kuettel, who salvaged them from being tossed. Much bluer than other varieties, it forms a perfect half-dome a foot tall. Ted was one of our best growers for decades. Day lilies, with their beautiful trumpet shaped flowers can thrive in almost any environment. From their original hot color schemes they have shifted into purples and even traces of blue. They put on their show in early summer, but increasingly varieties that rebloom are entering the market. Unrivaled in their exotic but short-lived glory, irises can get by with very little water and still present a great show. And they last a long time. It’s not unusual to find irises growing in what was a garden decades after the house they adorned is gone. Very few plants can rival their combinations of colors. And then there’s Iris Avenue in Boulder. It was named, no doubt, after the irises grown for decades at Long’s gardens right here in town. You know it’s summer when the distinctive scent of lavender wafts through the air. From to hulking “Grosso” which can get 3’ tall to the more polite English lavenders, lavender belongs in every garden. The flowers vary from the fat bumblebees of annual Spanish lavender to the symmetric constructions of “Hidcote” and “Munstead”. More recently a miniature form, “Lavance” has come onto the market, featuring intense cobalt blue blossoms. The beautiful five petal, sky blue flowers of Linum perenne are extremely well known around Boulder. You can find them hiking in our foothills, in the meadows above NCAR and even naturalized in the mediums on the Longmont Diagonal. The plants are extremely drought tolerant and will withstand our summer heat as well as our cold and snowy winters. They are deer resistant and don't seem to have any pests or diseases that bother them. They are perfect for informal naturalized plantings and are a must in any wildflower mix. Somewhere along the line oregano veered away from the kitchen and into the flower garden. Hop flower varieties keep the zippy flavor but feature one of the most unique flowers in the garden. They form a mound of trailing stems, bedecked with blossoms that, like their namesake, slowly extend from the inside out. Although they seem delicate, oriental poppies are tough once they get established. Traditional types include bright orange, deep red or white flowers. But some beautiful pastel peach and lavender hues have crept into the mix. One, “Carnival” is a picotee variety, with a white bloom edged in bright red. Another, Turkkenlouis, is a monster plant with red flowers. Poppies benefit from some shade and usually die back in late summer only to pop their heads above the soil in fall, getting ready for next year. From the delicate little penstemon hirsutis to the strapping four-footers, penstemon offer Colorado gardeners a wide choice of colors and shapes topped off with beautiful tubular flowers. They’re a favorite of hummingbirds and they thrive in the hot western sun. This plant is the 800-pound gorilla of xeric gardening. It will survive almost anything but shade, growing five feet tall and at least as wide. Long stems of lavender blooms bring bees by the hundreds and last more than six weeks. “Little Spires” comes in a little more than 2’ feet tall. Both pair well with lavenders and yarrows. Only a couple of weeks ago we spotted full-sized Russian sages planted tight and shorn into a rectangular hedge, quite an arresting sight! Finally there’s a rosemary that can survive the winter here. “Arp” was discovered in Arp, Texas and with good drainage and a little mulch it will come back year after year. “Goldsturm”—German for “Golden Storm” is the truly perennial rudbeckia that harkens the end of summer. Clusters of bright yellow flowers grace the garden for up to a month with diligent deadheading. Salvia come in so many shapes, colors and leaves that it’s sometimes hard to believe they’re members of the same family. Most gardeners are familiar with the dark blue “May Night” but don’t know there’s a sky blue variety as well. “Vermillion Bluffs” is a current favorite, with spikes of large bright red flowers reaching 4’ tall the first year. Scabiosas have distinctively intricate flowers. The original animal grew four feet tall and came in pink, blue, yellow and white. Most varieties now offered for sale are miniature vaieties. A recent introduction, “Mariposa” has intense purple flowers. The hummingbirds love this one! "Plant Select" loves this one. And we love this one. The color is equisite and the flowers really do remind one of a bunch of beautiful red birds sitting in a tree. It is endemic to a few mountains in central Mexico and is therefore very drought tolerant. Step back as it can get big and bushy and over four feet tall. It blooms happily in the xeriscape garden with its spires of small red, white lipped flowers. There are no groundcovers quite as colorful and sculptural as the sedums. They vary from rotund green “Old Man’s Bones” to shades of blue, red purple, yellow, white and chartreuse. It’s best to pick ones you like and enhance their effects with massed planting. These succulents like the Sempervivum and the ice plants all have thick fleshy leaves or stems adapted for storing water. Their taller cousins, such as the autumn joy varieties finish the season off looking like psychedelic broccoli. Either variety can be reproduced from any tiny lobes left to dry for a few days and then planted. Semps come in a wide array of colors and textures all based on the same theme—a central rosette of succulent leaves—the “hen”—surrounded by smaller carbon copies—the “chicks”. They do well in moist environments and dry. The chicks can be separated by teasing them away with their taproots intact. One spectacular use is to tuck them into the cracks of stone walls where, after years, they’ll colonize the entire wall. Tough and colorful, zauschneria (now called Epilobium) carpets the garden with tiny bright orange trumpets, very attractive to hummingbirds. Once established they’ll thrive on rainwater alone and they bloom from late July until frost.